The EVERBILT Mending Plate ideal reinforcement for flat surface joints seams or cracks. Countersunk design allows screws to sit flush with material. Easy to install. Leviton's Oval Head Milled Slot Replacement Wallplate 1/2" Long 6-32 Thread Screws come in ivory, white, black, gray, brown, and stainless steel. 3 in. Raised Oval Knob Back plate Cover an existing hole when mounting a new kitchen cabinet knob with the Liberty 3 in. Raised Oval Backplate Knob. 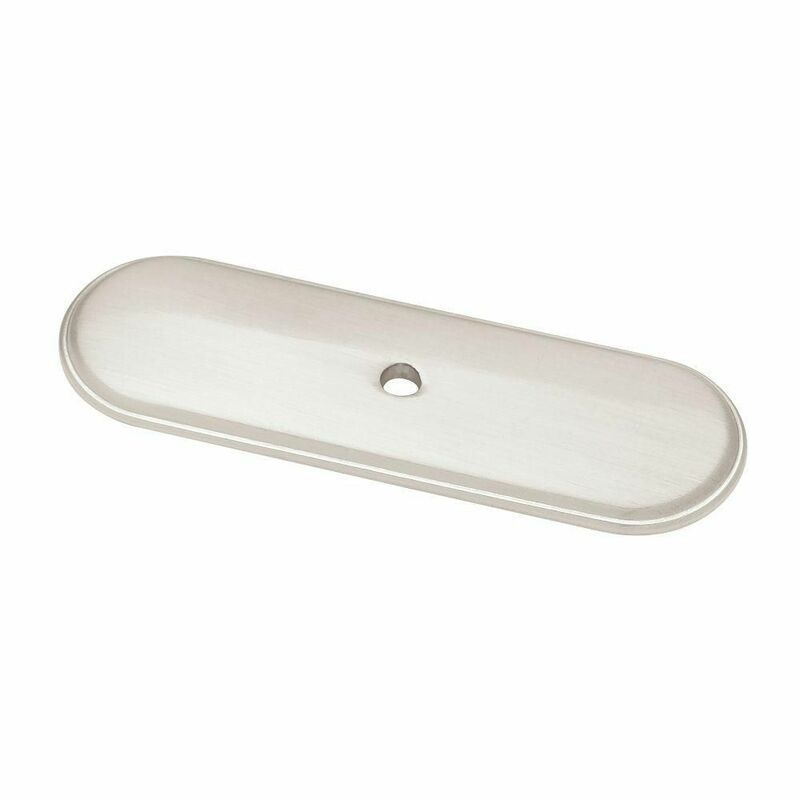 This high-quality die cast zinc backplate features a satin nickel finish and a traditional design. Rear mount installation. 3 in. Raised Oval Knob Back plate is rated 4.8 out of 5 by 36. Rated 5 out of 5 by Ron from Exactly what I needed.... Exactly what I needed. Rated 5 out of 5 by PD from I wanted something to cover the hole left from the... I wanted something to cover the hole left from the 3/4" sliding door caps on my pantry doors. These did the trick! I put them on and then screwed a knob to the plate screw and now have a better looking and more functional way to slide my doors open and closed...thanks, Home Depot! Rated 5 out of 5 by momofspecialdaughter from The plate and knob work good together. I had old knobs and holes that did not match any knob scre... The plate and knob work good together. I had old knobs and holes that did not match any knob screw holes. The plate hid one of the holes and looks very nice. Much heavier than I thought it would be. I was worried tightening the knob would dimple in the plate its heavy enough to keep that from happening when tightening the knob on top. Rated 5 out of 5 by jess from A simple but great upgrade to our satin nickel knobs. Note that with these plates you may have to... A simple but great upgrade to our satin nickel knobs. Note that with these plates you may have to get a box of longer screws then what comes with the new knobs. Rated 4 out of 5 by Sheldon from We used this backplate with a new Satin knob to replace brass ones on our old china hutch. The ol... We used this backplate with a new Satin knob to replace brass ones on our old china hutch. The old brass plate had a second pin and a hole in the door - this backplate was long enough to cover the extra hole.